If you’re tired of tripping on your tub walls, consider converting it into a walk-in shower. Getting rid of an old bathtub can transform a cramped bath into a more spacious and airy room. And if you’ve been thinking about making the change for a while, you’re not the only one. The American Institute of Architects conducted a Home Trends Survey that showed 54 percent of homeowners prefer showers without a tub. By making the switch, you’ll modernize your bathroom and potentially improve your home’s resale value. Feeling confident in your DIY skillset? Read on to find out how to convert your bathtub into a shower yourself. If you’re not handy, you may want to hire a contractor to handle this job. 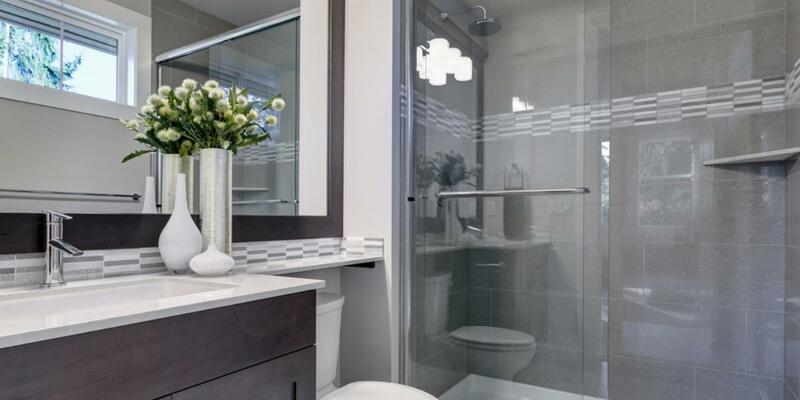 If you are getting rid of the only tub in your house – and have plans to sell in the near future – most realtors would advise against this project. According to Realtor Magazine, most homeowners want at least one tub in the home, especially if they have small children. The overall cost of your tub to shower conversion will depend on what kit you buy. Shower conversion kits are the easiest option for a DIYer to install and they contain all the items necessary to build a shower floor slope, including the curb, guards and shower pan liner. Kits range in price from about $200 to $2,000 depending on what style you want. You’ll also need to budget for a liner, hardware and any new tile and grout you’ll need. If you have leftover tile from a previous homeowner or builder, you can save on this material cost. But if you need to purchase new tile for the shower, it’s important to set a realistic budget. Here are the standard costs for common shower tiles. Ceramic and Porcelain Ranges from $0.50 to $15 per square foot. Granite Ranges from $3.50 to $7 per square foot. Marble Ranges from $5.00 to $50 per square foot. Polished Stone Ranges from $10 to $12 per square foot. Exact pricing for each tile type will depend on the color and finish you choose, but setting your budget for materials now will help you rule out options outside your price range and make planning easier. Most shower conversion kits come in either a curbed or curbless model. Here’s how to decide between the two options. Curbed: These have a shower pan with a low barrier that completely encloses the space. This helps keep water inside of the shower, but you will still have something to step over when entering. Curbless: This model sits flush with the floor. Getting the shower pan to that level can make the installation more difficult, and typically more expensive. Before you start any demolition work, take some measurements to make sure your tub to shower conversion plans are up to code. Shower stall needs to be at least 30 inches x 30 inches. The National Kitchen and Bath Association recommends building the stall at least 36 inches x 36 inches, but most building codes will accept the former. Finished ceiling height should be at least 80 inches. Distance from the side of the toilet to the shower wall should be at least 15 inches, but 18 inches is ideal. Shower door swing can vary based on the size of your bathroom, but measure the distance between the vanity and future shower to avoid issues. If you’ve chosen a sliding door or a curtain, this measurement isn’t necessary. Once you’ve decided on a shower type and purchased the necessary kit and materials, it’s time to grab the tools you’ll need to pull off the job. Drywall saw or reciprocating saw if you have plaster walls. Before you can tear out your tub, you’ll need to remove the old tile and drywall around it. Lay the plywood on the bathroom floor to prevent damage. Shut off water to your bathroom. Remove the hardware from the bathtub. This includes unscrewing the main and overflow drain covers and faucet knobs. Use an Allen wrench to loosen any screws and pull the faucet from the tub. Score tile grout with a utility knife, then pry tiles off the wall using a metal putty knife. Typically, you’ll need to go about 8 inches above the tub for removal, but if you plan on re-tiling your new shower start at the top of the wall and move towards the bottom. Cut through drywall or plaster using a saw, but be careful not to cut too deeply as you may hit a stud. From the access panel behind your tub (or in the basement) disconnect the main and overflow drains. Now that you’ve taken down the tile and hardware and shut off the water supply, it’s time to tear out your old bathtub. Remove any nails or screws that hold your tub in place. Cut through caulk on the floor using a utility knife. Inch your tub away from the wall using a pry bar. Cut your tub in half using a saw if you have narrow doorways. Removing your tub in one piece will require a helper or two. Pry each piece up individually and take it to the dumpster. Pro Tip: You can leave your tub in one piece for removal. But always measure first to make sure it will fit through your doorway. Now that your tub is gone, it’s time to complete your shower conversion by following the instructions on your shower kit. Most include a DVD or online video to walk you through the process step-by-step. Now that you have a brand-new shower, it’s time to take a look at your vanity, countertops and floor. Check out our guide to demolishing your bathroom to kick-off your next remodeling project and our tips on how to complete the job on-budget. For more DIY home improvement tips and tricks, visit the For the Home section of our blog. 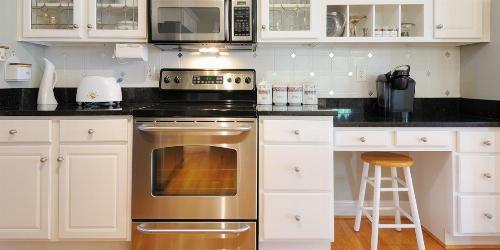 Replacing your kitchen countertops can make a significant impact on your home’s value. Learn how to install laminate countertops with expert tips from Formica. Revamp your outdated bathroom. 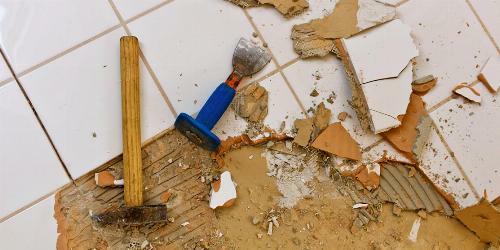 Learn how to DIY the tile removal process with our simple, step-by-step guide.